Capcom mailed a cereal-box sized... box today for Street Fighter II HD Remix. Inside, a smorgasbord of goodies including a red Street Fighter headband, a Udon Street Fighter Remix comic, a Chun Li figure and one of those magnetic boards (this one looks like E Honda's hangout) that you can slap stickers on and off. 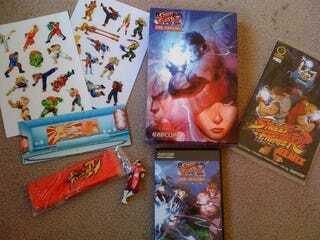 It also came with two sheets of Street Fighter stickers so you can create your own little battles on the fridge. All perfect to add to the growing mountain of schwag I've been saving up for this year's Funde Razor in Denver.